Our company began in 2011 when my heart was broken wide open for families living in extreme poverty in Haiti. The stories of those I met were beautiful in spite of their desperate living conditions and I felt drawn to be part of their lives by providing steady work that would assure food, shelter, and education to families in communities where jobs were so scarce. Our story didn’t stop in Haiti. With two centers operational there, Vi Bella expanded to the small village of Pesqueria, Mexico. We also employ women in transitional housing near our home office in Sioux Center, Iowa. 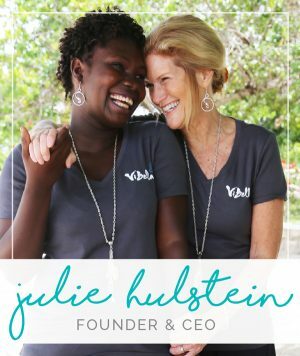 The Vi Bella story has grown to provide employment, education, and opportunity to more than 30 artisans in Haiti, Mexico, and right here in the United States. We also partner with organizations that provide employment in India and Ecuador. In 2017, Vi Bella expanded even further to acquire the operations of Three Cords Haiti, an amazing job-creation ministry operating in Haiti under the umbrella of The Mission of Hope. The addition of these 24 artisans has expanded the impact of Vi Bella as well as the product lines. We now offer gorgeous, hand sewn items by these talented artisans. Thank you for joining the transformation story. When you purchase Vi Bella jewelry, host a Gathering, become an Ambassador, or hold a fundraiser, you join a beautiful story which is bringing hope and healing to our artisans, their families, and their communities. You are helping us make beautiful jewelry and accessories, but more importantly, you are creating beautiful lives.